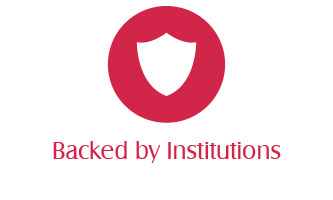 CAREHEALTH PLUS SYSTEMS INTERNATIONAL. INC. (CareHealth Plus) is a trailblazing healthcare institution duly registered last July 3, 2015 with the Securities and Exchange Commission (SEC) and fully secured with an initial authorized capitalization of P50million, currently among the highest in the HMO industry. 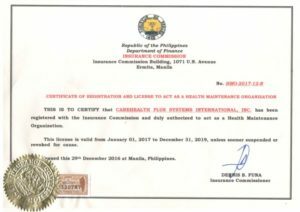 As the HMO official regulatory body, the Insurance Commission (IC) has officially upheld CareHealth Plus as among the select number of established HMO companies in the country with the issuance of IC Certificate No. HMO-2016-15-O, attesting to our Company’s “Certificate of Registration and License To Act As A Health Maintenance Organization”. This IC Certificate of Registration and License has been renewed last December 29, 2016 through the issuance of IC Certificate No. HMO-2017-12-R, with a Three (3) Year Validity from January 1, 2017 to December 31, 2019. The ”PLUS” in our company’s name emblazons a pioneering concept in value-added services still left untapped in the broad spectrum of medical benefits and personal preferences offered by existing Health Maintenance Organizations (HMOs) in our country today. With more than 20 years of aggregate work experience in the HMO industry, the formidable organization of CareHealth Plus management specialists leaves no stone unturned in establishing a solid base of highly selected customer-friendly sales professionals in the local and international fronts of the healthcare arena. Hand-in-hand with CareHealth Plus is a powerhouse Total LifeCare Team of superior medical institutions and avowed medical practitioners. CareHealth Plus maintains its prestigious office address at Suite 1210-B, 12th Floor, Ermita Center Building, 1350 Roxas Boulevard, Ermita, Manila with telephone numbers (02) 247-1878 • (02) 521-8752 and its 24/7 Hotline number (02) 208-4611 and mobile phones Globe/TM (0977) 804-2137 and Sun/Smart (0925) 652-1927.